My most frequent walking route takes me down Mosley and around to Cabana, then off on Cassady and Adelphi before coming back to my house. Usually, I walk at night when photos don't work as well, but today I took an early evening walk to try out my new camera, a Panasonic Lumix DMC-TZ1. I needed to get used to its features before heading off to the UK. I'm in the middle of uploading the pictures from my set to Flickr, but this one inspired a posting. 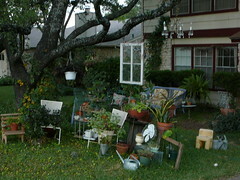 This house always has a rather eclectic front yard, with many plants and an old window sill hanging from a tree. I like it; it feels like a colony of south Austin in my neighborhood. I also like the house with the big ham radio tower, and until recently, I enjoyed walking by "The Warwick", a house at the corner of Mosley with a big sign displaying its name mounted on the entrance way.